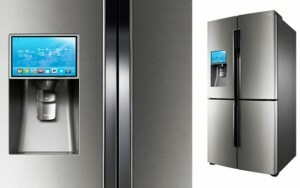 Is this fridge, with a built-in tablet, trying to do too much? Samsung is coming out with a $4,000, four-door fridge that has its own LCD touchscreen, complete with a calendar, baby monitor, weather app and Evernote (the digital posted note application). We’re of the opinion that this all-in-one appliance is similar in concept to the ‘futuristic’ gadgets Walter Cronkite and his CBS News team assumed there’d be more of in today’s households. Here’s a look at the fridge in video. Is this something you’d like in your home, or is a fridge touchscreen a redundancy, what with all the smartphones and tablets?